Both right now, through this year (a reason for missing a week or more!) but also though life. This week marks 32 (!!!) years since I first passed my driving test. 32 years. When did that happen? This actually seems to be a theme running though my life right now as I look back and realise how long ago things happened. So, this week, I'd like you to be inspired by driving. You might love or hate driving. You might like to talk about your own driving experience, when you passed your test, a funny/great/bad story related to driving. Perhaps you'd like to capture a road trip you've actually experienced or one you'd like to take. You might even have car or driving themed products that need to find a home on a page which you could follow through for this prompt. This is a layout I've made in the past about the way back home to Germany after a trip home to the UK and the road trip routines I have. 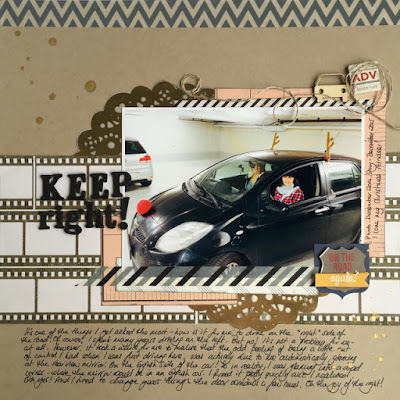 And then there was this one I wrote about driving on the "wrong" side of the road since I moved here featuring my little car complete with Rudolf nose! Where will the week's road (pun intended) take you? We'd love to see what you make with this or any other prompt and you can share over at our Whimsical Musings Flickr gallery here with the tag WM#269 or at our Whimsical Musings Facebook group also using the tag WM#269. It's always lovely to see your creations.